Any economist would tell you that levels of UK household debt rose to unprecedented levels in the run up to the financial crisis. This is because the data are readily available (e.g. see Chart 1 here). What is much trickier to show is who is bearing the brunt of this debt and how it has evolved over time and across generations. Doing this requires the arduous task of tracking the debt of individuals, or groups of individuals, for long periods of time. Yet this is very handy because you can then compare how your parents’ generation fared when they were your age; or how your children’s generation fare compared to you, when you were their age. 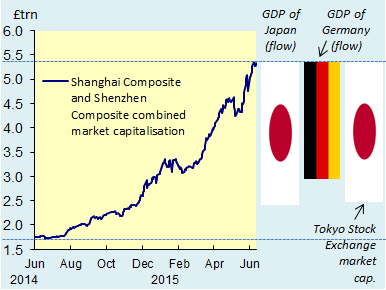 Economists call this generational comparison ‘lifecycle analysis’. To construct lifecycle charts, I mostly use data from the Living Costs and Food (LCF) survey from 1992 to 2012. The first two charts show real outstanding levels of mortgage debt and real incomes respectively. 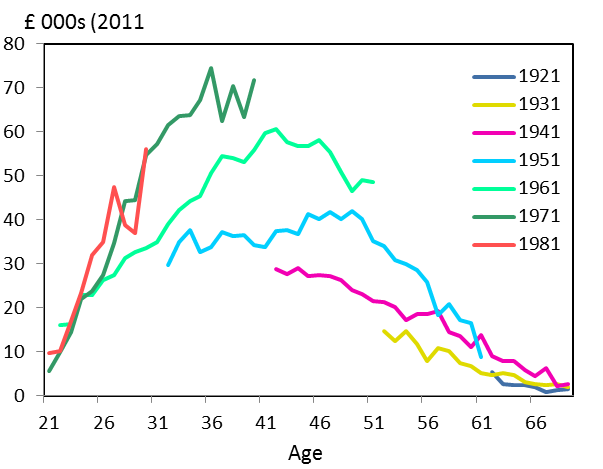 Each line represents a 10-year date of birth cohort. 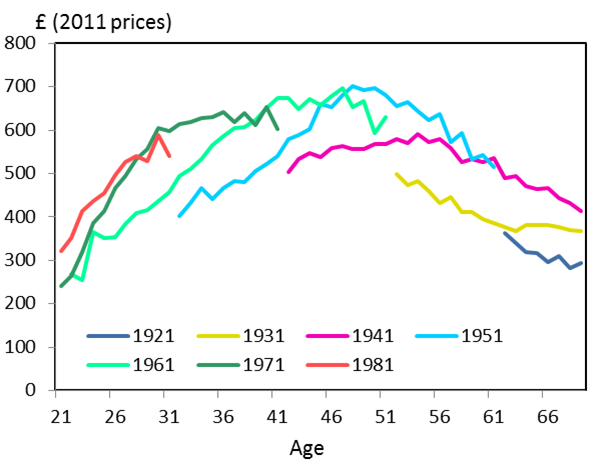 For example, the pink line represents those born between 1941 and 1950. As we move from left to right, we can see different generations as they age over time. Ideally, we would like to see how the older cohorts’ income and debt looked like when they were 20 (but that would have been before 1992—when the data begin), as well as how the younger cohorts’ income and debt is when they’re 50 (but they’re not 50 yet—so we can only make predictions). I find these charts really striking. Let’s start with debt. First, the difference between each cohort and its immediate predecessor is widening. There is hardly any difference between the 1941 and 1931 cohorts, but the differences between the 1951, 1961, and 1971 cohorts are staggering. It seems that secured debt is rising super-fast for the young. A second pattern is that the curves display very different shapes. The younger cohorts have much more distinctive inverted-U humps than older cohorts which remain elevated for much longer. It is possible to imagine a world where younger households will reach 65 and still have debt. Turning to income, the differences across cohorts are much more subdued. In fact, the 1981-1990 cohort are practically earning the same as those born between 1971-1980 (the orange and green lines sit on top of each other). Taking the charts together, one can conclude that income growth has been unable to keep up with the pace of house price inflation. Yet perhaps we needn’t worry ourselves so much because these indebted households are also those who own all the assets. Unfortunately, this fact can easily be refuted if we look at the data from a different angle. The following two lifecycle charts examine how mortgage debt and housing wealth respectively are distributed by age over different years. One can clearly see that the younger groups have taken the lion’s share of the increase in debt from 1995-2012, but it stands in stark contrast to wealth accumulation, where the biggest winners have been the older generations. It seems that the widening gap between the haves and the have-nots isn’t just across income or socioeconomic categories—as some have been (correctly) arguing—but also across generations. Source: British Household Panel Study (BHPS), Wealth and Assets (WA) Survey and author’s calculations. No wealth data is available from the LCF. Instead, 1995 and 2005 data are taken from the BHPS. 2006/7 and 2011/12 data are taken from the WAS. The 2005 diamonds serve as a rough cross-check against 2006/7 data to ensure accuracy of spliced datasets. This spectacular divergence between income and debt for younger groups is worrying. Superficially, the charts suggest that it might become routine for younger cohorts to retire with mortgages—something unprecedented for the UK. More substantively, as housing wealth is inherited across generations, it’ll be ever the more important to come from a family that has housing wealth. 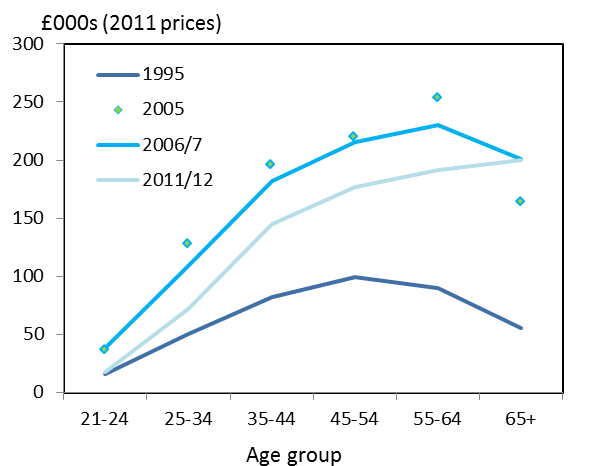 Chart 3 also shows that the level of debt of younger groups has decreased (the 2007 line shifts downwards in 2012). There is some evidence to suggest that the younger households have been the ones deleveraging (see slide 20 here), which may reflect concerns about debt. An alternative explanation is that younger generations are finding it increasingly difficult to borrow to start with. Is that a good thing? Or is that a reflection of a world where the lucky few have incredibly high levels of debt while the unlucky young have no debt at all? 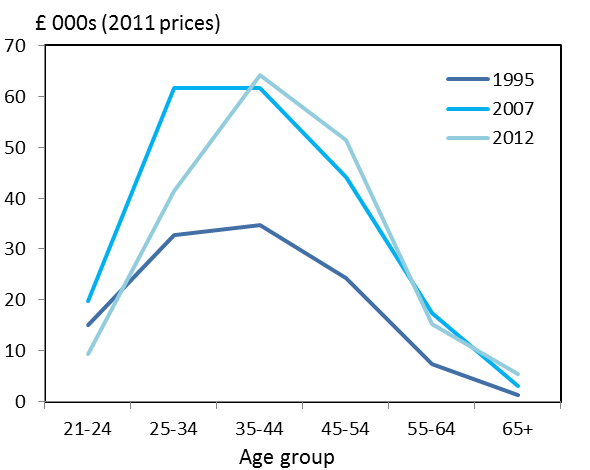 Among other things, the young are bearing the debt burden. This is something the newspapers write about with vigour, and something the average Joe would tell you is indisputable. This post attempts to bridge the gap between the anecdotal and the numerical. There is an explosion of policy questions that arise from such an exposition. And it is one that others have been warning us about too: there is a whole book devoted to a parallel issue. The sooner we start addressing the causes, the less likely your kids or grandkids will be inheriting the mortgage along with the house.